Eloise Elliot is one of the youngest newspaper editors in the country. But on the eve of her thirtieth birthday, she’s hit with a sharp pang of loneliness. With dazzling clarity, she realises what she wants- someone to share her life with. Fast forward three years and she is the adoring mother of a gorgeous little girl, Lily. Juggling a high-powered job with single motherhood is not easy and when Lily starts asking about ‘Daddy’ Eloise begins to panic. What will she tell her? When I think of a Claudia Carroll book, I automatically think of being curled up on the sofa with a brew and the fire on. She always manages to create stories that give you a ready-brek like glow, and her last few books have been great. This book opens on Eloise, the main character, celebrating her thirtieth birthday with a few ‘friends’ from work. It’s a bit of a damp squib, for want of a better phrase, and it causes Eloise to reflect on her life so far. Being one of the youngest newspaper editors in Ireland doesn’t exactly give her life a lot of meaning, so she makes a drastic decision, with dramatic consequences. While other little girls were fantasising about becoming doctors or lawyers, Alex Garrett dreamed of conquering the high powered world of Wall Street. Now she’s grown and determined to make it big in bond sales at Cromwell Pierce, one of the Streets most esteemed brokerage firms. Though she’s prepared to fight her way into an elitist boys club, she starts out small, relegated to a kiddie-size folding chair with her new moniker ‘Girlie’ inscribed in Wite-Out across the back. Always keeping her eyes on the prize (and ignoring her friends pleas for her to quit), Alex quickly learns how to roll with the punches, rising from lowly analyst to slightly-less-than-lowly associate in no time. Suddenly she’s being addressed by her real name, and the boys club has transformed into forty older brothers... and one possible boyfriend. But then the apocalypse hits, and Alex is faced with the most difficult choice of her life: stick with Cromwell Pierce as it teeters on the brink of disaster... or to kick off her Jimmy Choos and go running for higher ground. This book examines a woman’s place in the infamous boy’s club of Wall Street. Alex, the protagonist, is a feisty character who constantly challenges the sexist views of her colleagues, in particular her brusque (but loveable) boss Chick. Anne Wynter’s job as governess to three highborn young ladies can be a challenge- in a single week she finds herself hiding in a closet full of tubas, playing an evil queen in a play and tending to the wounds of the oh-so-dashing Earl of Winstead. After years of dodging unwanted advances, he’s the first man who has truly tempted her, and it’s getting harder and harder to remind herself that a governess has no business flirting with a nobleman. I have to hold my hands up and admit that when this book dropped onto my doormat I wasn’t too keen. Historical romance has never gripped me, and when I saw this book I came over a little shivery at the thought of stepping out of my contemporary chick lit comfort zone. However, I am all for the benefit of the doubt and once I picked it up and read the first few chapters, I found that I was enjoying it. We meet Tess, the main character of the book, after her boyfriend, Seb, has just broken up with her. She’s devastated, which is to be expected, and her flatmate and best friend Fiona invites her to a New Year's Eve party to try and cheer her up. Tess goes but leaves early to go home and wallow in bed with her cat Flea. Tess drinks a whole bottle of tequila and has a sort of boyfriend bonfire (burning all of the stuff from her relationship with Seb) and falls asleep face down on her bedroom floor. Tammy and Alvin had mapped out their entire lives together, including a pre-parental plan- a list of everything they wanted to do as a couple before they had children. But no amount of planning could have anticipated the heartbreaking problems that lay ahead- problems that shattered their once-perfect relationship and led to a traumatic break-up. Then, after years of trying to move on, Tammy’s world is turned upside down when Alvin comes back into her life asking for a second chance- with a difference. He proposes that they spend time together, doing the things they had once so eagerly planned, in a bid to remember why they felt they’d have children together some day, and ultimately recapture what they had. Still in love with Alvin, Tammy finds herself powerless to say no, even though their problems are still simmering in the background and threatening to boil over at any moment. Still, what they once had is surely worth trying to save. From the cover, I automatically assumed that this was a light-hearted piece of chick lit with a simple storyline: boy meets girl, they have a happy relationship but drift apart, still hopelessly in love with each other they meet up again and everything is hunky dory. I know I should try not to judge a book by its cover but, having read as many books as I have, I’ve developed a talent of guessing how a story will pan out just by looking at the jacket and reading the synopsis. I was made to look a fool, though, because this book is anything but light-hearted fluffy romance wrapped up in a pretty package. Dan - dark and brooding, he has to work day and night to achieve his dream of rowing in the London Olympics. Rollo- rich and arrogant, when he’s not rowing, he spends his time seducing women and spending money. Amy- a brilliant cox who catches the eye of both Dan and Rollo. In the boat, the men row perfectly together, but on land, they despise each other. So with the addition of Amy to the mix, sporting behaviour is the last thing on their mind. May the best man win? Not a chance. From Henley Regatta to the Oxford-Cambridge Boat Race, and finally the biggest race of their lives, their determination to settle old scores threatens to capsize everyone’s plans. When Kate Lace wrote for Little Black Dress I read all of her titles - they were a perfect escapist reading for me. So when I read about her second release under Arrow Books I thought ‘this should be good’. I also have to admit that I had an immature little snigger at the title, but I soon got over that! What? I’m only human! Cox! Every bride dreams of looking beautiful on her wedding day, don’t they? Violet doesn’t. She is dreading it. In fact she can’t think why Sebastian ever asked her to marry him. When they met, she was a size 14-16. Now she is a size 20. How will she ever find a dress which doesn’t make her look ridiculous? And fat. Dieting club NewYou! promises the answers. But things just go from bad to worse. It is time for Violet to come up with some solutions of her own. I remember when our Ed Kirsty G put a post up on the site about this book and I thought it looked brilliant. A light hearted piece of chick lit perfect for a lazy day. I was partly right... this was the perfect book for a day when you don’t have anything to do, but it was not as light hearted as the cover conveys. Violet is overweight and insecure and we are introduced to her as she is legging it into Marks and Spencer to buy the biggest chocolate cake ever. She has just found out some disturbing news regarding her fiance Sebastian. Rebecca: As her glamourous London life comes crashing down, Rebecca flees to her childhood home to recover. Joe: Born in the same country town as Rebecca, he hasn’t seen or spoken to her in a decade. Now he’s the successful owner of a wine bar, Maison Joe, and is breaking local hearts. As Rebecca and Joe are forced to confront the past, bittersweet memories rush back, along with unanswered questions. Can Rebecca ever forgive and forget? I read Alice Peterson’s last novel Monday to Friday Man sometime last year and really enjoyed, so when I saw TEN YEARS ON in the bookshop I picked it up without hesitation. It didn’t take long to grasp the storyline in this book - it dives straight in to the events surrounding Rebecca, the main character, moving back home to her parents who live in the country. The basis of the story is sad and you can’t help but be moved by Rebecca’s situation and the life-changing events that occur. I won’t give too much away but I will say that it gives a good tug on the ol’ heart strings. Amber Scott loves her city life- a dream job working on a glossy magazine and a fiancé, Ed, she’s known since uni. So Ed’s news that he has taken a job in the West Country turns Amber’s world upside down. After reviewing Ruth Saberton's last book Ellie Andrews has Second Thoughts and loving it, I couldn’t wait for her third noveI. I have come to love Ruth's dry wit and kooky leading ladies. I have to admit that when I first started reading I struggled to get stuck in. It took quite a while to get to the main plot-point of the story. After the initial introduction into Amber and Ed’s life in London - Amber getting a new job on a glamourous magazine and Ed accepting this new job offer - they eventually up sticks and move to Cornwall. This is where the book really picked and I think I must have finished it in a day and a half. Our Afternoon Tea with Lindsey Kelk! A few weeks ago I received a Facebook message from Novelicious Ed Kirsty asking me if I would like to attend an Afternoon Tea in a hotel in Birmingham with Lindsey Kelk. 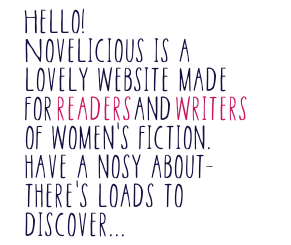 A chance to meet one of my favourite chick lit authors? I can tell you that my exact answer was ‘Hell Yeah!'. Upon finding the hotel in Birmingham (yes, I know I live in the city, but this was the posh side of town that I very rarely frequent!) I was shown into a lovely garden/conservatory type place that had tables and chairs dotted around, and in the middle was a long table with eight women seated around, including Lindsey Kelk. I made my way over to the table, quietly introduced myself, and received a bright grin from the very down to earth author. Once settled with napkin on lap and champagne in hand, we started chatting about Lindsey's books, hot men in films that we’d seen recently and whether Lindsey would include a wrestling character in her next book (she’s a massive wrestling fan!). Sophie Klein walks into a bar one Friday night and her life changes. She meets James Stephens: charismatic, elusive, and with a hosiery model ex who casts a long, thin shadow over their burgeoning relationship. He’s clever, funny and shares her greatest pleasure in life: to eat and drink slightly too much and then have a little lie down. Sophie’s instinct tells her James is too good to be true- and he is. Looking at the cover of this book and seeing the gorgeous light blue background teamed with the swirly pink writing, you’d be fooled into thinking that this is a piece of light-hearted chick lit. Upon reading the book I found it to be heart-wrenching and bittersweet as we follow Sophie in her quest to get over the one guy who broke her heart. When we’re introduced to Sophie, she is confident, happy and loving her job as a Pudding Developer for a company called Fletchers. I know what you’re thinking: chick lit mixed with talk of puddings sounds like the best book EVER, but it’s not all sweetness and light. Samantha Brooks’ boyfriend Jamie has made a big mistake. One his friends, family and Sam herself know he’ll live to regret. Jamie is loving, intelligent- and a free spirit. After six years in one place, doing a job he despises, he feels compelled to do something that will tear apart his relationship with Sam: book a one way flight to South America. Sam isn’t giving up without a fight. With Jamie still totally in love with her and torn about whether to stay or go, she has five months to persuade him to do the right thing. So, with the help of her friends Ellie and Jen, she hatches a plan to make him realise what he’s giving up. A plan that involves dirty tricks, plotting and a single aim: to win him back. Only, by the time the tortured Jamie finally wakes up to what he’s lost, a gorgeous new pretender has entered Sam’s life. Which begs the question... now he’s hers for the taking, does she still want him back? This book has been on my To Read list since the synopsis was released on Amazon months back. I always look forward to reading a Jane Costello book; the stories are consistently funny, with twists and turns that never fail to keep me hooked. And the fact that this book was released in hardback first shows that she has reached the big leagues as an author. Excellent work, Jane!